Fred Magdoff is professor of plant and soil science at the University of Vermont in Burlington and a director of the Monthly Review Foundation. He is coauthor with Harry Magdoff of “Approaching Socialism,” in the July–August 2005 issue of Monthly Review. Stagnation, of course, does not mean that there is no growth whatsoever. Rather, the economy functions well below its potential—with appreciable unused productive capacity and significant unemployment and underemployment. Over the last thirty years an average of 81 percent of industrial capacity was used, and during the last five years the average was only 77 percent. There is normally significant unused production capacity even in the recovery phase of the business cycle. During the largely boom years of the 1960s the manufacturing sector was producing at close to 85 percent of capacity; even in the best year, 1966 (during the Vietnam War), manufacturing production only reached 91 percent of capacity. Indeed, the average gain in actual employment since the end of the last recession has been extremely sluggish. As economics writer Floyd Norris pointed out, “At this point after the previous nine recessions, there were an average of 11.9 percent more jobs in the economy than there had been at the end of the recession. But so far [August 2006]…there are just 3.5 percent more jobs than at the end of the last recession” (New York Times, September 2, 2006). Thus, three years into a recovery from a relatively mild recession we still have significant indicators of stagnation. Capitalist economies are based on the profit motive and accumulation of capital without end. Hence problems arise whenever they do not expand at reasonably high growth rates. Those problems range from high unemployment/underemployment to frequent recessions to stock market crashes to inflation to deflation. A number of mechanisms, which are briefly assessed below, have served either to counterbalance or represent attempts to overcome mature capitalism’s tendency toward stagnation. However, as Magdoff and Sweezy pointed out: “The tendency to stagnation is inherent in the system, deeply rooted and in continuous operation. The counter-tendencies, on the other hand, are varied, intermittent, and (most important), self-limiting” (Stagnation and the Financial Explosion, Monthly Review Press, 1987, 24). As industries mature and their products saturate markets at home corporations seeking profitable outlets for their commodities and their capital increasingly attempt to export products and invest abroad. This together with other important objectives—such as controlling sources of raw materials needed for production and taking advantage of low wages and lax environmental and labor safety standards—augments the imperialist drive that is an essential characteristic of capitalism. Neoliberal globalization is the most recent manifestation of imperialism: capital (large corporations, both financial and non-financial) using governments, and especially the leadership of the U.S. government, to make it easier to exploit the world’s resources and people. The ideal situation for capitalists is to be able to invest and sell where and when they want, to move money and products in and out of countries and to repatriate profits at will. This imperial thrust growing out of the natural workings of a capitalist economy provides profitable outlets that might not be available in the home country as well as enhanced profitability at home, through control of markets for raw materials needed by industries. To give some idea of the importance of profits from investments abroad in the total U.S. economy, these represented about 6 percent of total business profits in the 1960s, 11 percent in the 1970s, 15 to 16 percent in the 1980s and ’90s, and have averaged 18 percent for the five-year period 2000–04 (calculated from 2006 Economic Report of the President, table B–91). It is true that investment in the periphery has created new outlets for investment-seeking capital. However, for a variety of reasons, such as the worldwide competition for markets, global stagnation (evident in the growth of worldwide excess capacity), and the soaring surplus obtained from exploitation of third world markets, which adds to the capital looking for outlets, such external expansion has not seriously alleviated the tendency toward an overaccumulation of capital on either a U.S. or world scale. Key inventions and technologies have at times significantly stimulated the economy, sometimes for decades. For example, the invention of the automobile in the early twentieth century led eventually to huge developments that transformed the U.S. economy, even aside from the mass ownership of automobiles: the building of an extensive system of roads, bridges, and tunnels; the need for a network of gas stations, restaurants, automotive parts and repair shops; the efficient and inexpensive movement of goods from any location to any other location. Another of the profound effects of the widespread personal use of the automobile was the increase in suburbanization of housing. On the negative side, the automobile virtually eliminated much urban and interurban public surface transportation, created a vast new source of pollution (and carbon dioxide), and by the second half of the twentieth century compelled U.S. foreign policy to ensure that oil and gas continued to flow to power such developments. Thus, the technology of the automobile stimulated the economy for decades of the twentieth century in numerous ways. The new information technologies (computers, software, the Internet), while certainly changing the way individuals and companies work, do not appear to be providing a similar epoch-making, long-term economic stimulus, although the “silicon revolution” has had important economic consequences. The rise of the silicon-based industries and the Internet are two relatively recent examples of how military projects “create new industries.” Additionally, actual warfare such as the U.S. wars against Iraq and Afghanistan (and the supplying of Israel to carry out its most recent war in Lebanon) stimulates the economy by requiring the replacement of equipment that wears out rapidly under battle conditions as well as the spent missiles, bullets, bombs, etc. To get an idea of how important military expenditures are to the United States economy, let’s look at how they stack up against expenditures for investment purposes. The category gross private investment includes all investment in business structures (factories, stores, power stations, etc. ), business equipment and software, and home/apartment construction. This investment creates both current and future growth in the economy as structures and machinery can be used for many years. Also stimulating the economy: people purchasing or renting new residences frequently purchase new appliances and furniture. The rate of annual increases in consumer expenditures fall somewhat with recessions and rise as the economy recovers—but still increases from year to year. However, the swings in private investment are what drive the business cycle—periods of relatively high growth alternating with periods of very slow or negative growth. In the absence of the enormous military budget, a huge increase in private investment would be needed to keep the economy from falling into a deep recession. Even with the recent sharp increases in the military spending and the growth of private housing construction, the lack of rapid growth in business investment has led to a sluggish economy. The creation of debt in both government and private sectors also boosts the economy. Deficit spending by the government is one of the Keynesian answers to recessions, putting new dollars into circulation to create “demand.” (Experience from the United States during the Great Depression as well as the recent example of Japan indicates that Keynesian debt spending does not in itself solve problems of severe economic downturns. It was not Keynesianism but the Second World War that catapulted the U.S. economy out of the Great Depression.) Likewise, when a bank lends money to a company to expand its operations or to an individual to purchase a home or a car, there is more activity in the economy than would otherwise occur. However, there are differences between consumer and corporate borrowing. When people borrow to purchase consumer goods, the purchase itself provides an immediate stimulus. Those who made and transported and sold the goods get money that they can use in turn, and usually do so immediately. There may even be a small ripple effect in the economy. However, when corporations borrow to build more physical plant, purchase durable machinery, or start a business in the services, the effect of the spending of borrowed money continues for years as economic activity is expanded and jobs are created. Marx expressed the accumulation of capital through investment as M–C–M´. M(oney) capital is used to purchase raw materials, machines, and labor to produce C(ommodities), which are then sold, with the capitalist receiving back M´—the original money plus ªm, the surplus value produced by labor. In the financial circuit of capital, in contrast, money makes more money directly, represented by Marx as M–M´. Although in some respects a simplification, at one time it was fairly reasonable to think of banks as primarily loaning funds that had been deposited by the public. They collected interest and principal from those who had taken on debt and paid a share to depositors. However, today’s banks have themselves become massive borrowers. Financial institutions of all types now accumulate huge quantities of debt as they attempt to make money with borrowed money. This debt undertaken by financial institutions for the purpose of speculation has little to no stimulatory effect on production. Relatively few people are employed in the process of speculation (say, per billion dollars borrowed and speculated with) compared to other more productive uses for that capital. Profits resulting from these debt-financed transactions rarely are turned into investment in factories or service sector firms that create jobs. Rather such speculative profits are normally used to generate even more profits through various other speculation schemes, or for high living by the rich. As a result, stagnation in employment in recent years has gone hand in hand with a new opulence among the main beneficiaries of the financial expansion. 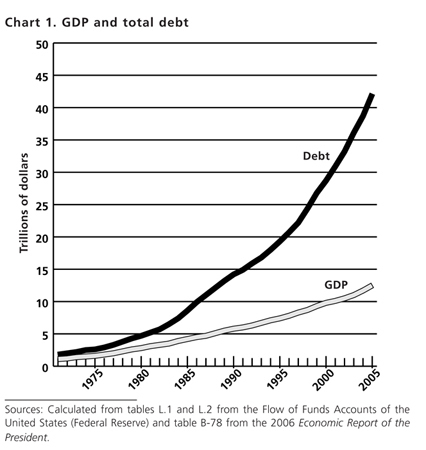 The rapid expansion of debt in the U.S. economy—much greater than the expansion of economic activity (as measured by increased Gross Domestic Product, or GDP)—was dramatically described by Magdoff and Sweezy in their introduction to Stagnation and the Financial Explosion. However, it turns out that what they observed in the early to mid-1980s was only an early portent of what was to be an unprecedented upsurge of debt in the economy (see chart 1).4 The divergence between the growth in outstanding debt in the economy and the underlying economic growth is truly astounding. 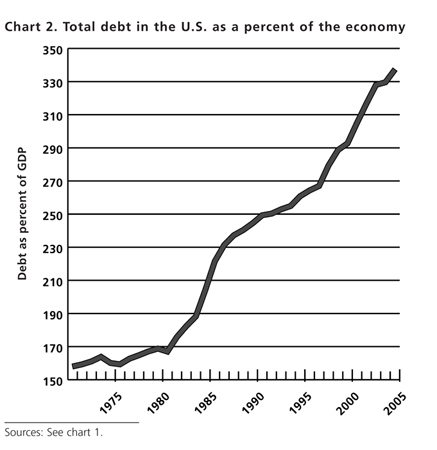 In the 1970s outstanding debt was about one and a half times the size of the country’s annual economic activity (GDP). By 1985, about the time that they were increasingly focused on the subject, it was twice as large as the GDP. By 2005 total U.S. debt was almost three and a half times the nation’s GDP (see chart 2), and not far from the $44 trillion GDP for the entire world. Total debt in the United States is composed of debt owed by households, government (local, state, and federal), non-financial businesses, and financial institutions. While there has been near continuous growth in debt since the late 1970s, there were bursts of debt growth relative to GDP—in the period 1981–88 (when Magdoff and Sweezy published many articles on the subject), and then again in 1997–2005. In the 1980s, the sectors with the greatest increases in debt relative to GDP were financial institutions, whose debt grew from 22 to 42 percent of the GDP in 1981–88, and government debt, which grew from 44 to 69 percent of the GDP in the same period. During the second debt burst, 1997–2005, financial business debt grew even more as a percentage of the GDP, exploding from 66 percent to over 100 percent of the GDP. During this second period household debt also shot up, from 67 to 92 percent of the GDP, in large measure because of home refinancing during the housing boom, and increased credit card debt. The debt of non-financial companies is continuing to grow rapidly. According to the Wall Street Journal, “Corporations are borrowing money at the fastest clip in several years amid a wave of leveraged buy-outs and acquisitions, rising capital expenditures and pressure from shareholders for larger dividends and share buybacks….Nonfinancial companies saw their debt rise 6.3% in the 12 months that ended in the first quarter to $5.5 trillion. That is the fastest yearly growth for debt in five years. In 2005, debt increased at an average 12-month pace of 5.1%, while in 2004 debt growth was 2.7%…” (August 17, 2006). However, it is not just non-financial corporations among today’s corporations that have experienced this financial explosion. They have been outdone in recent years by their financial counterparts. Not only has the debt exploded in absolute numbers, and grown just as dramatically relative to growth in the nation’s economy, its composition has changed considerably. The financial sector’s debt, which accounted for about 10 percent of total U.S. debt in the early 1970s, has soared and is now close to a third of the total (chart 3). 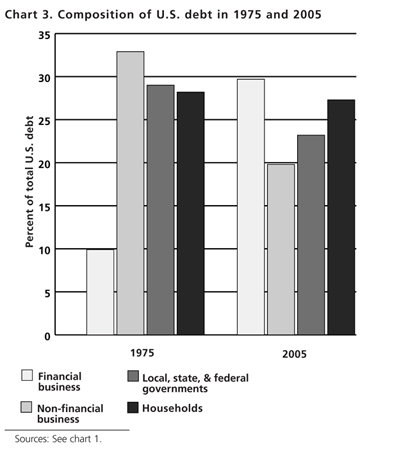 The debt share of nonfinancial businesses and government decreased quite dramatically over the same period, while consumer debt remained at about the same proportion of total debt as it was in the economic crisis period of the mid-1970s. As the overall debt grows larger and larger it appears to be having less of a stimulating effect on the economy. There are few places where Magdoff’s and Sweezy’s thesis—that there is an implacable drive toward stagnation in mature capitalist economies—is clearer than in the following statistics. Although there is no exact relationship between debt creation and economic growth, in the 1970s the increase in the GDP was about sixty cents for every dollar of increased debt. By the early 2000s this had decreased to close to twenty cents of GDP growth for every dollar of new debt. Debt, as we have seen, can be used for all sorts of things—some stimulate the economy greatly and have a long lasting effect (investment in new businesses or expanding old businesses), some have a moderate and relatively short-term effect on the economy (households taking equity out of their homes or running up credit card debt to purchase consumer items), and some which have little to essentially no effect on the economy (financial speculation). The change in the composition of the debt, with financial debt now larger than any other single component and growing faster than all the rest (a shift from M–C–M´ to M–M´), may explain much of the decreased stimulation of the economy by debt expansion. Clearly, though, the tendency toward stagnation—and capital’s need to look for “investments” in speculative rather than productive activities because of that stagnation—marks the current era. There is, of course, no way to predict the level at which too much debt might cause a deep and prolonged crisis. Stock market bubbles burst in 1987 and 2000 without slowing down this process of debt explosion, except temporarily. How long this can continue without a much bigger, longer lasting calamity that will reach to the core of the system is anyone’s guess—but to assume that it will continue forever is certainly wishful thinking to an extreme. The large and steadily increasing consumer debt relative to income is already creating difficulties for those who must pay back their debts while sustaining their living expenses. (See John Bellamy Foster, “The Household Debt Bubble,” Monthly Review, May 2006, and “Homeowners Start to Feel the Pain of Rising Rates,” Wall Street Journal, August 10, 2006.) Last year U.S. households spent a record 13.75 percent of their after-tax, or disposable, income on servicing their debts. With little to no income growth among wage earners, the past year (July 2005–June 2006) has seen people spending $1.1 trillion more than they earned (Bureau of Economic Analysis release 0634, August 1, 2006). This negative personal savings rate is unprecedented in the years since the Great Depression. U.S. household debt hit a record $11.4 trillion in last year’s third quarter, which ended September 30, 2005, after shooting up at the fastest rate since 1985, according to Federal Reserve data. Total household debt stood at $11.8 trillion at the end of March 2006 (Federal Reserve Flow of Funds). This acceleration of household debt has been aided in large part by the Federal Reserve in response to the stock market implosion in 2000. When the Fed reduced interest rates to historically low levels to keep the economy from falling into a deep recession, households increased borrowing on homes, cars, and credit cards. Household mortgage debt increased 75 percent from 2000 to 2005 as home owners refinanced and obtained larger mortgages—pulling money out of their homes to use for various purposes—and as new people participated in the housing boom homes sold at increasingly inflated prices to those with low credit ratings. This had the effect of shifting the stock price bubble to a bubble of home prices. This stimulated the economy, with investment in private housing increasing to 36 percent of total private investment in 2005—a level not seen since 1958 during the great suburban housing boom resulting from the second wave of automobilization. Americans have been purchasing new homes and going into more debt by obtaining new mortgages on existing homes in which they take on a larger mortgage based on the appreciated value of their houses. In addition, new types of mortgages have been developed for those who cannot really afford to purchase housing (“sub-prime” mortgages, at higher rates of interest, but with “come-ons” to make them look affordable). These include mortgages in which very low interest rates are charged for a few years before the rates become adjustable and/or those in which 100 percent of the house value are financed. If interest rates increase substantially—a real possibility—the cost of past borrowing will bring major pain to many households, with increased mortgage foreclosures and bankruptcies and rising late fees and rate hikes on credit card debt. We are already witnessing the beginning of this phenomenon as those relying on adjustable rate mortgages and people who borrowed 100 percent of the value of their homes are now facing the twin problem of higher mortgage payments at the same time that homes values in some locales are declining (Wall Street Journal, “Homeowners Start to Feel The Pain of Rising Rates,” August 10, 2006). Foreclosures have increased dramatically in 2006—even among those with good credit ratings. Nonetheless, there’s lots of money being made with these types of mortgages by the mortgage brokers, the banks that originally loan the money, the loan distributors, and the hedge funds and institutional investors that purchase these loans packaged with higher quality ones. As Business Week put it: “In this game almost every player wins— except for the cash-strapped homeowner” (“Nightmare Mortgages,” September 11, 2006). There is not enough space here to go into all of the implications of the enormous federal debt in the United States, which have been widely reported. In the last years of the Clinton administration the convergence of fiscal restraint and a speculative bubble mainly in information technology stocks led to federal budget surpluses. Since President Bush took office, annual federal deficits—and the federal debt—have grown massively. This government borrowing, in large measure to “pay” for tax cuts to the wealthy (redistributing income upward) and costly wars in Afghanistan and Iraq, is one leg of the so-called twin deficit. The other leg is the current accounts deficit. Along with the explosion of debt has come the exceptional growth of finance and financial speculation in the U.S. economy—stimulated significantly by increasingly higher levels of debt. As we will see below, debt helps to fuel financial speculation and at the same time financial speculation leads to more debt! With profits from new investments more difficult to make in the “real” economy (where something is actually made or a service delivered) of mature capitalist production, another of capital’s responses to stagnation has been the expansion of the financial system, along with many new gimmicks designed to appropriate surplus value from the rest of the economy. Because they didn’t know how else to invest the funds, in mid-2006 U.S. corporations held the equivalent of 20 percent of their stock market value as cash and Treasuries. Moreover, surplus capital is not just an issue in the United States. Even with supposed investment opportunities in growing economies like China and India, a Wall Street Journal article described a huge quantity of “money sloshing around the world”—as a result of effectively interest-free money available in Japan and the United States, low interest rates in Europe, and massive amounts of “petrodollars” generated by high oil prices (March 7, 2006). This is a situation, as we know from the passage cited earlier, that Marx anticipated. The financial sector now has the onus of providing new and expanded outlets for the massive hoard of capital. Mainstream economists generally ignored stagnation and failed therefore to recognize the structural roots of the financial explosion or its dangers. In sharp contrast, Magdoff and Sweezy identified early on the critical importance of the growing role of the financial sector in the stagnating late twentieth-century economy. As they explained, with the development of giant corporations toward the end of the nineteenth century “the composition of the capitalist economy underwent a qualitative transformation. The issuance of many types and quantities of corporate securities brought in its train the development of organized stock and bond markets, brokerage houses, new forms of banking, and a community of what Veblen called captains of finance who soon rose to the top of the capitalist hierarchy of wealth and power” (Monthly Review, May 1983). They went on to describe the incredible pace of development in the financial sector through the twentieth century up until the period of the 1980s, when they were writing, calling this growth a “financial explosion.” The last twenty years have only confirmed this assessment. Finance (banks, investment firms, insurance companies, and real estate consortia) develops an ever-growing number of new ways to try to make money with money—M–M´ in Marx’s formulation. Thus, finance is not only the “glue” that connects the various parts of the capitalist system and the “oil” that lubricates its workings, finance has become a dominant activity in mature capitalist economies. The importance of finance even to non-financial corporations can be seen by examining the bottom line of many major manufacturers and retailers. As explained in Business Week, “At Deere & Co., the farm-equipment company, finance produces nearly one-fourth of earnings. Retailer Target Corp. (TGT) usually gets about 15% of its earnings from its credit cards. And while General Motors Corporation (GM) is having trouble selling cars, its ditech.com mortgage business is going great guns. GM’s financing operations earned $2.9 billion last year, while GM lost money on cars” (March 28, 2005). Even the giant retailer of consumer goods Wal-Mart has gotten into the act and has begun offering a variety of financial services such as bill payment, check cashing, money orders, and wiring money to other countries. The magnitude of speculation in all manner of financial “instruments” such as stocks, futures, derivatives, and currency is truly astonishing. Magdoff and Sweezy were clearly astounded by this tendency when they first sounded the alarm. Today financial analysts frequently pretend that finance can levitate forever at higher and higher levels independently of the underlying productive economy. Stock markets and currency trading (betting that one nation’s currency will change relative to another) have become little more than giant casinos where the number and values of transactions have increased far out of proportion to the underlying economy. For example, in 1975, 19 million stock shares traded daily on the New York Stock Exchange. By 1985 the volume had reached 109 million and by 2006, 1,600 million shares with a value of over $60 billion (http://www.nyse.com). Even larger is the daily trading on the world currency markets, which has gone from $18 billion a day in 1977, to the current average of $1.8 trillion a day! That means that every twenty-four days the dollar volume of currency trading equals the entire world’s annual GDP! Currency speculation is especially attractive—you can trade twenty-four hours a day and it’s easy to get in and out quickly. However, “foreign-exchange veterans warn that the risks are huge. Traders can leverage their positions to place bets valued at as much as 200 times the money they put up. If a bet goes wrong, they can lose by a corresponding amount” (Wall Street Journal, July 26, 2005). Although almost all currency trading is in major currencies such as the dollar, the yen, the euro, and the pound sterling, one relatively recent gambit involved borrowing Japanese yen, because the government had been trying to stimulate its economy by having effectively zero interest rates. These funds were then moved to countries with relatively high interest rates like Australia, New Zealand, Turkey, and Iceland. So much money moved into Iceland to take advantage of the 11.5 percent interest rate on the krona, that when it began to be withdrawn after Japan indicated it was going to raise interest rates, the krona and the Icelandic stock market fell dramatically. There are all sorts of ways to play the market game. For example, one can bet on the price of a particular stock going down (short selling) by selling borrowed stock and agreeing to repurchase the stock and return it to its owner at a particular time in the future. One can buy the right to purchase a stock in the future at a particular price (a call option), or sell a stock in the future (a put option) at a particular price. One of the more bizarre futures markets was created in 2003 by the U.S. Government’s Department of Defense along with a private company—betting on the likelihood of assassinations and terrorist attacks. As then Senate Minority Leader Tom Daschle, D-South Dakota, said on the Senate floor: “I couldn’t believe that we would actually commit $8 million to create a Web site that would encourage investors to bet on futures involving terrorist attacks and public assassinations…I can’t believe that anybody would seriously propose that we trade in death…How long would it be before you saw traders investing in a way that would bring about the desired result?” The uproar resulted in the canceling of the government’s participation in the program. Derivatives and hedge funds have also played a critical role in the explosion of financial speculation. The daily turnover of foreign exchange and interest rate derivate contracts (including traditional instruments such as outright forwards and foreign exchange swaps) between April 2001 and April 2004 increased by an estimated 74 percent, to $2.4 trillion. The notional amounts of over-the-counter derivatives (the sum of the nominal absolute value of all deals concluded and still open) at the end of June 2006 was $283 trillion—more than six times all the goods and services produced in the world during a year’s time. To give some idea of the continuing pace of derivative activity, during the first half of 2006 “the global market in credit derivatives grew 52 percent, to $26 trillion” (New York Times, September 22, 2006). This market has grown at a pace of over 100 percent a year during the last four years. U.S.-based hedge funds, currently with assets of approximately $1.2 trillion, quickly move large amounts of capital into and out of investments—it’s estimated that they do about half of the daily trading of stocks in the United States. And while they claim high returns, there are many dangers lurking behind the big chances these funds are taking. For example, the hedge fund Amaranth Advisors lost $6 billion, more than half of its assets under management, during one week in September. They lost so much money so rapidly by placing large bets on the price of natural gas, which is a lot more volatile than the price of oil. They bet that the price difference between gas for delivery in March 2007 and gas for delivery a month later (April 2007) would continue to widen. Instead, as gas prices generally decreased in September, the spread narrowed significantly. Clearly, this type of speculation creates potential instability in the financial system. As an article in the New York Times put it: “Enormous losses at one of the nation’s largest hedge funds resurrected worries yesterday that major bets by these secretive, unregulated investment partnerships could create widespread financial disruptions” (September 19, 2006). We are in the midst of a frenzy of acquisitions of companies by other companies and buyouts in which private investment firms acquire corporations. Most of these involve a significant amount of leverage (borrowing), thus adding to the overall debt in the system. An article on Forbes.com last year explained, “The feverish pace of activity [of leveraged buyouts] is a tribute to the reality that investors are scrounging for any sort of deal that will get them a better return on their money than long-term Treasuries can give them” (November 18, 2005). This year we are on a pace to exceed the $3 trillion total value of mergers and acquisitions at the height of the last frenzy in 2000 (Wall Street Journal, June 27, 2006). The activity has been especially large for a number of reasons, primary among which is the amount of capital sloshing around in the system. As the Wall Street Journal put it: “The piles of cash and stockpile of repurchased shares at…companies have hit record levels and continue to grow along with corporate earnings, creating challenges for the executives who must decide how to allocate all that capital” (July 21, 2006). Buyouts of corporations by private investment groups supposedly add value as the new managers improve a troubled company and then sell new stock to public investors. However, in the current environment it is not uncommon for private capital to, in the words of a Business Week headline, “Buy it, Strip it, Then Flip it” (August 7, 2006). Income can be generated very quickly in these deals. For example, the private investment firms that purchased Burger King Corporation in 2002 actually used their own money for only one-third of the $1.4 billion purchase price. Where did the rest of the money come from? It came as debt taken on by the Burger King Corporation. This extra debt allowed Burger King to pay the new owners $448 million in “dividend and fees” including $55 million in interest on their loan, which the company repaid early with new borrowings” (Wall Street Journal, July 25, 2006). So the private equity firms essentially got their money back in the process of acquiring a 76 percent stake in Burger King, now estimated to be worth $1.8 billion—more than three times their initial investment! Purchasers of the company’s stock, meanwhile, are buying a large debt load that had not been there previously. According to Standard & Poor’s, over the last three years, “companies have borrowed $69 billion primarily to pay dividends to private-equity owners….That compares with $10 billion in the previous six years” (Wall Street Journal, July 25, 2006). And buyouts through July of 2006 were close to $200 billion, about double the amount for the full year of 2004. In essence, capital is using the vast surplus at its disposal not to invest in new productive capacity, but in corporate buyouts aimed at increasing their financial claims to wealth. These leveraged buyouts are creating more debt at the same time they create huge profits for speculators. Whether the companies they purchased through leverage buyouts are made more profitable before being sold back to the public through the issuance of new stock is debatable. What is not debatable is that the taken-private companies are laden with debt. twenty percent [of corporations selling stock through IPOs—initial public offerings] carried net tangible book-value deficits even after raising money through their IPOs, meaning that, if those companies were liquidated the day they came public, stockholders would receive nothing. The majority of debt-heavy companies went public as a result of the private-equity investment process. Private-equity firms, such as Apollo Management LP and Cypress Group, are behind 40% of the IPOs…this year. They often purchase companies by investing some cash and leveraging the rest of the asking price, with the debt landing on the balance sheets of their new acquisitions. Currency and futures speculation, trading in complex derivatives, the emergence and growth of hedge funds, and the stunning increase in debt are all responses to the same phenomenon. As the economy of production of goods and services stagnates, failing to generate the rate of return from M–C–M´ that capital desires, a new type of “investment” has emerged. It seeks to leverage debt and embrace bubble-like expansions aimed at high, speculative profits through financial instruments. The depth of stagnation, and its tenacious hold on the mature capitalist economy, is amply testified to by the flight of investment into what we have called “the giant casino.” The reduction of real wages (adjusted for inflation) and the redistribution of wealth upward (through reduced taxes and reductions in social services)—the results of class war waged unilaterally from above—have not been enough to guarantee an ever-increasing spiral of return on capital invested in the productive economy. Thus, continual recourse to new forms of gambling, not production of goods or services, is what capital is generating in the pursuit of profit. The huge expansion of debt and speculation provide ways to extract more surplus from the general population and are, thus, part of capital’s exploitation of workers and the lower middle class. A number of capital’s techniques have been discussed above: (a) extending more and more loans to the general public and corporations; (b) lending to low-income people under very unfavorable and hard to understand terms; (c) adding debt to corporations through leveraged buyouts (making the companies more financially fragile and demanding cutbacks in jobs, wages, and benefits to compensate); (d) unbalancing trade with the rest of the world, requiring enormous sums of money to be invested in the U.S. from abroad, and (e) placing huge bets on almost anything imaginable. A lot of people are making money off of these activities—except for those at the bottom who are left to foot the bill when problems arise. An idea of how much the general public has to pay for the financial shenanigans that capital plays—as the cost of failure is passed down from capital to the public—is indicated by the U.S. government bailout of the savings and loan industry in the 1990s which cost somewhere around $175 billion, adding to current and future personal tax obligations! There is growing concern about the potential consequences of the growth in debt and speculation and changes in the financial system (for example, see “The Dark Side of Debt,” The Economist, September 23, 2006). The president of the New York Federal Reserve Bank, Timothy Geithner, feels that the changes in the financial system since 1998 (and the selling of debt obligations to numerous buyers) have lessened the chances that relatively small shocks will upset the entire system. Yet, “the same factors,” he wrote, “that may have reduced the probability of future systemic events…may amplify the damage caused by and complicate the management of very severe financial shocks. The changes that have reduced the vulnerability of the system to smaller shocks may have increased the severity of the large ones” (September 15, 2006, Federal Reserve Bank of New York). Numerous sources of fragility are introduced into the U.S. economy by the various techniques capital uses to try to overcome the obstacles to profitable opportunities caused by stagnation. These have created trends that cannot continue without generating bigger contradictions in the future: the huge annual imbalances of trade between the United States and the rest of the world; ever expanding debt in all sectors of the economy relative to the underlying economy; the shift of the financial sector into ever larger-scale speculation. There are limits (though not easily discerned) to the size of the financial superstructure relative to the productive base. Although devised as ad hoc ways to cope with stagnation, such speculative “solutions” cannot continue to expand the system, balloon-like forever. The only questions are how will it all end and where will capital turn when these mechanisms have run their course? One possibility is a severe and long lasting recession with generalized deflation. Another is that the government continues successfully to intervene to bail out the financial system when it gets into trouble such as with the banking system failures in the 1980s and the near collapse of Long Term Capital Management in the late 1990s. However, with the magnitude of the intertwined debt and speculation so enormous, it is clear that these types of interventions can bail out the system at most only temporarily, while extending the overall crisis and the long-term threat to the economy. ↩ The Dynamics of U.S. Capitalism (1972), The End of Prosperity (1977), The Deepening Crisis of U.S. Capitalism (1981), Stagnation and the Financial Explosion (1987), and The Irreversible Crisis (1988). ↩ See Stephanie Aaronson, et. al., “The Recent Decline in Labor Force Participation and its Implications for Potential Labor Supply” (preliminary draft), Division of Research and Statistics, Board of Governors of the Federal Reserve System, March 2006 (available at http://www.brookings.edu). For a discussion of the wider issue of unemployment, underemployment, and the reserve army of labor see Fred Magdoff & Harry Magdoff, “Disposable Workers: Today’s Reserve Army of Labor,” Monthly Review 55, no. 11 (April 2004): 18–35; and The Editors, “What Recovery,” Monthly Review 54, no. 11 (April 2003): 1–13. ↩ The data on military expenditures is from official figures, and thus excludes much of what should be included in military spending, e.g., homeland security, much of NASA, parts of the State Department budget, veterans’ benefits, etc. For a classic treatment of this problem see James Cypher, “The Basic Economics of ‘Rearming America,’” Monthly Review 33, no. 6 (November 1981): 11–27. ↩ When the amount of government debt is used, as in total U.S. debt, this includes debt held by federal agencies, such as the Social Security Administration. The amount of this debt is currently $3 trillion—representing close to 42 percent of the total federal debt. Although technically it is a debt owed by the government to itself, in reality it is a debt to particular people—for example, those that will be retired on Social Security when there is less Social Security tax coming in than needed to pay retirees.